The hallmark of a typical oil and gas well lifecycle is a series of concerted efforts aimed at the optimal recovery of hydrocarbons. Over several phases, various techniques and technologies are employed, depending on the age of the well, the unique characteristics of the formation, and cost considerations. This article will outline the various phases of hydrocarbon production and explore the application of Nitrogen gas injection for enhanced oil recovery. Primary oil recovery begins at the end of completion operations – after the newly-drilled wellbore has been cased and cemented with a production tree installed at the wellhead. In this phase, engineers utilize pumping operations alongside the natural formation pressure to flow oil and gas to the surface. After the well has produced for a while, the initial formation pressure will decline. A secondary hydrocarbon recovery phase then becomes essential to ramp up production volume. 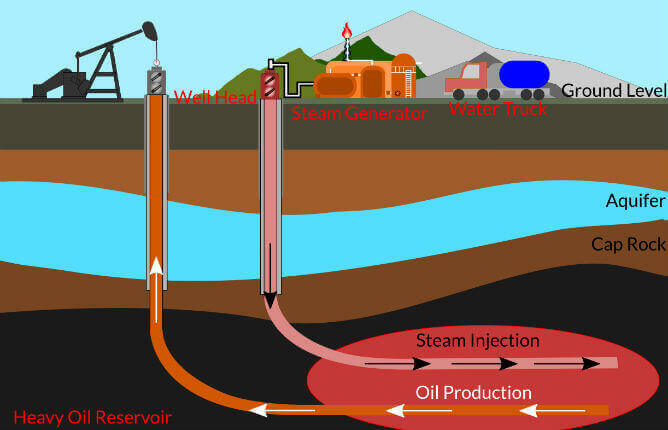 For further recovery, the operator injects water or gas into the target reservoir through nearby injection wells to ‘sweep’ hydrocarbons towards the production well. Primary oil and gas recovery methods unlock only about 10% of the oil initially in place (OIIP), while secondary recovery efforts obtain an additional 20 – 40%. Therefore, a substantial quantity of oil remains in the formation until more advanced recovery methods are employed. These methods are collectively known as enhanced oil recovery (EOR) techniques. As the well ages, secondary oil recovery techniques become unviable for sustaining production volume. This is because the remaining oil is trapped in low-permeability sections of the reservoir having irregular fault lines. Enhanced oil recovery techniques attempt to artificially modify the reservoir characteristics in order to restore formation pressure and improve oil displacement. When done correctly, EOR efforts can recover up to 75% of OIIP and boost existing production volume by as much as 200-300%. Chemical flooding or injection utilizes chemicals like surfactants and polymers (long-chain molecules) to enhance hydrocarbon mobility by reducing the viscosity of the oil. For instance, chemicals like liquid CO2 can be used to re-pressurize ultra-deep wells and reduce the surface tension of crude. However, chemical flooding is an expensive process and represents only a small percentage (<1%) of EOR efforts in oil and gas plays in the U.S. Thermal EOR intervention involves raising the temperature of crude-bearing sections of the reservoir in order to decrease the oil viscosity and improve its mobility. To carry out thermal flooding, water, steam, or other fluid at high temperature is injected into the formation to improve its permeability for oil seepage to occur. Like chemical flooding, thermal flooding is a costly process. It also poses safety and regulatory concerns for the industry as it could irreversibly alter subsurface well structures. In gas injection EOR, Nitrogen, CO2, or natural gas is injected into the reservoir to improve or stabilize production. Gas flooding improves natural gas recovery by expansion and crude recovery by dissolving in the oil to decrease its viscosity and improve flow. Let’s take a closer look at the use of Nitrogen for gas injection in oil wells. For decades, major oil and gas operators in the industry have explored the viability of using Nitrogen gas injection for oil recovery due to its highly compressible nature, inert chemical properties, and reasonable cost of generation (the raw material is atmospheric air). N2 is used for EOR by ‘miscible displacement’ or ‘miscible flooding’ – the process of improving hydrocarbon mobility by reducing the interfacial tension between oil and water. In Nitrogen gas injection, N2 of a suitable Minimum Miscible Pressure (MMP) is injected into a reservoir to free up hydrocarbons trapped in the formation. At very high pressures (~15,000 psi), N2 forms a miscible slug that sweeps oil and gas from hard-to-reach sections of the reservoir and pools them together, after which they will be pumped up the production well for collection. This process can recover up to 60% of OIIP. Nitrogen gas injection is one of the more favored EOR techniques because it is cost-effective and sustainable. A single rail car (N2 storage and transport unit) can hold as much 1.2 million standard cubic feet (SCF) of liquid N2. Another advantage of using Nitrogen gas injection for enhanced oil recovery is its inert chemical characteristics. N2 can prevent down-hole combustion of flammable gases and has no corrosive effect on pipelines, unlike CO2. A nitrogen injection system is the full array of equipment needed to carry out nitrogen injection. An essential component of an N2 generation system is the Nitrogen generator – used for producing on-demand N2 by cryogenic fractional distillation from atmospheric air. Serving the oilfield industry since 1999, NiGen International is at the forefront of cutting-edge innovation, design, and fabrication of on-site nitrogen systems. NiGen generators utilize the most efficient membranes in the industry with portable containerized and skid-mounted solutions available to suit every operation. NiGen industrial nitrogen generators ensure a dependable and economical supply of high-purity Nitrogen for optimal recovery of hydrocarbons in the world’s most challenging oil and gas fields. Contact us today for more information about our generators and rental equipment.